A high school in Prince George's County was locked down Tuesday after a student was found to have a gun and a former student was seen trespassing onto school grounds, police said. 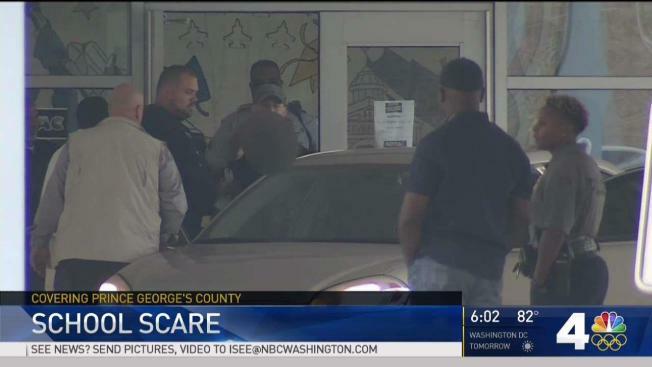 Potomac High School in Oxon Hill, Maryland, was locked down for about two hours Tuesday morning during the scare. No one was hurt, but many families were terrified about the children's safety. "I actually received a text on my phone, and it really upset me," Karen Rhodes, the grandmother of a student, said, fighting tears. "It said there was a gunperson at Potomac High School, they were on lockdown, and I just freaked out." The student accused of having the gun was handcuffed and taken away for questioning, News4 video showed. Police are working to track down the former student. School officials became aware of the gun in the high school because of an alert teacher. The teacher spotted a 10th-grade boy exchanging cash with a former student about 9:45 a.m. The former student stood out, because he was not wearing a school uniform like the school's students do. The teacher flagged the situation to a school resource officer, who then patted down the student, a Prince George's County Public Schools spokesman said. The officer found the 10th-grader had a handgun. The former student ran from the school and was not immediately found. Students sat in the dark for two hours and were told to turn off their phones, one student told News4. The lockdown had been lifted by 11:40 a.m., police said. Students then resumed their regular school day. News4's Pat Collins asked Principal Nathaniel Laney if the school needs metal detectors. "That's not for me to decide," he replied. He said he's not worried for the students. The student who brought the gun just made a bad decision, he said. "Young people make bad decisions, and I think we've just got to teach them the right way," Laney said. The search for the former student accused of trespassing is ongoing.